Since All-on-4 anchored dentures are fixed into place by four surgically implanted titanium posts, patients who choose this innovative tooth replacement option benefit from a number of advantages. Compared to traditional dentures, All-on-4 eliminates slippage along the gum line as well as the need for messy pastes or adhesives. Each All-on-4 denture is secured to the jaw by four dental implants, and the results of this restorative dentistry technique are considered permanent, allowing you to eat, drink, smile, and speak with confidence. All-on-4 anchored dentures are custom-made to fit comfortably and look natural. Like dental implants, anchored dentures do not need to be removed for cleaning; however, since dental implant candidates need to have sufficient jawbone density for the procedure, All-on-4 can serve as a good alternative for patients who are not eligible for a full set of dental implants. As an added advantage, All-on-4 anchored dentures are often a more cost-effective solution for replacing an entire row of teeth. Ultimately, patients who choose All-on-4 enjoy the stability, strength, and comfort dental implants can provide, while achieving a full, beautiful smile. To learn more about All-on-4 anchored dentures, please schedule a consultation with Dr. Kevin Sands today. For patients missing a full row of teeth, All-on-4 implant supported dentures offer an innovative alternative to traditional dentures. All-on-4 anchored dentures use four strategically placed dental implants to secure each denture for increased comfort, strength, and stability. Replacing your missing teeth with these durable restorations can effectively reconstruct healthy dental form and function with long-lasting results. The All-on-4 technique uses the same titanium posts that typically serve as artificial tooth roots for single dental implants. Rather than placing porcelain crown restorations on these posts, cosmetic dentist Kevin Sands, DDS will securely fasten your custom-made upper or lower denture to these four points to eliminate the need for denture adhesives. These titanium implants are surgically placed in the jaw and can eventually fuse to the jawbone, providing exceptional support and stability. For patients with diminished jawbone density, All-on-4 may also provide a more feasible alternative to a full set of single dental implants. The All-on-4 procedure can typically be performed within the span of one day, instantly rejuvenating your smile with natural-looking results. Most patients are able to return to their normal routine the following day. For more information about All-on-4, please schedule a consultation with Dr. Sands. On Sunday October 25, 2016, Dr. Kevin Sands appeared on Keeping Up with the Kardashians. As the chosen cosmetic dentist for the entire Kardashian clan, Dr. Sands is dedicated to keeping their famous smiles looking absolutely perfect. On this episode, Khloe visits Dr. Sands for a dental exam and cleaning with her friend Malika in tow. For Invisalign® candidates, the overwhelming advantages of this innovative orthodontic solution make it very appealing to both teens and adults. Using a system of custom-made, clear plastic aligners, Invisalign® can discreetly straighten your teeth without drawing unwanted attention. These aligners are designed to fit teeth snugly throughout treatment to provide comfort and allow for more natural speech. Since the aligners are removable, Invisalign® also allows you to eat, drink, and clean your teeth with ease – which eliminates dietary restrictions and hygiene challenges. If you want to straighten your teeth for a healthy looking, beautiful smile in a manner that is virtually invisible, Invisalign® may be an ideal orthodontic solution for you. Invisalign® system involves a series of clear plastic aligners that progressively guide teeth into proper alignment. These aligners are custom-made for each patient, ensuring a precise, comfortable fit as they exert gentle pressure on the teeth to stimulate movement. Each set of Invisalign® aligners is worn for approximately two weeks before moving on to the next set, which further advances treatment toward the goal of a straighter, more beautiful smile. The duration of Invisalign® treatment can vary from patient to patient, and is dependent upon several factors, including the magnitude of orthodontic correction required and the consistency of aligner wear. Dr. Kevin Sands recommends patients wear their aligners for a minimum of 22 hours each day, removing them only to eat, drink, or clean the teeth. The average Invisalign® treatment typically takes about 9-15 months, though patients may begin to see noticeable improvements as soon as six weeks after treatment begins. During your initial consultation, Dr. Sands may be able to give you a more accurate estimate of how long your Invisalign® treatment may take. If you are looking to improve the appearance of misaligned teeth, Invisalign® is an innovative orthodontic solution that can help you avoid many of the inconveniences and discomforts of traditional braces. Using a system of clear plastic aligners that are custom-made to fit your teeth, Invisalign® can gradually guide your teeth into proper position to fix many common orthodontic concerns, such as crowding, gaps between teeth, and an unbalanced bite. If your smile is impacted by any of these orthodontic conditions, Invisalign® can help you achieve a beautiful smile – and often in less time than traditional braces. The best way to find out if Invisalign® is right for you is to schedule a one-on-one consultation with cosmetic dentist Kevin Sands, DDS. He will perform an oral examination, discuss your individual goals, and help determine if you are a good candidate for Invisalign®. While some of our patients with mild tooth misalignment may opt for porcelain veneers to quickly transform their smile, patients with more severe orthodontic issues may achieve more effective treatment with Invisalign®. Schedule a consultation with Dr. Sands today to discuss which treatment options can work best for you. Here at his Beverly Hills practice, Dr. Kevin Sands is no stranger to the fast-paced lives of his celebrity patients. So when Kim Kardashian chipped her front tooth just hours before needing to fly to Las Vegas for an appearance on Friday, Dr. Sands was able to come to the rescue. 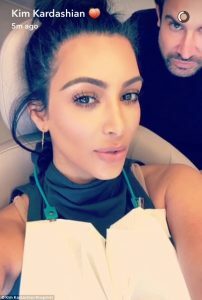 Kim, whose presence has one of the largest followings on all social media platforms, was quick to keep her fans up-to-date by Snapchatting this event straight from her favorite dentist’s dental chair! With a swift last-minute appointment, Dr. Sands was able to repair Kim’s tooth back to it’s original beauty and make it to her Las Vegas appearance on time. 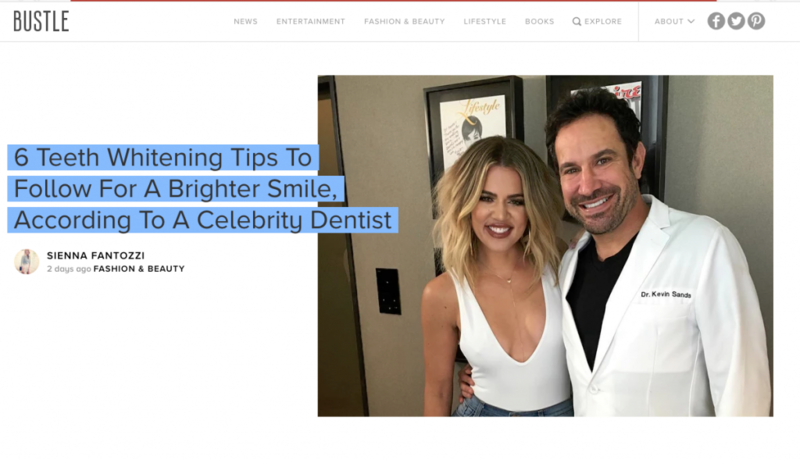 Read more about her latest trip to our Dentist of the Stars office on People, Us Weekly, Hollywood Life, and Daily Mail. To learn more about our dental treatments offered, or to schedule a consultation with Dr. Sands, please contact our office today. How Can I Close a Gap Between My Teeth without Braces? Gaps between teeth are a common cosmetic concern that cause many of our patients to feel self-conscious about their smiles. For those who are hesitant to invest the time required for orthodontics, Dr. Kevin Sands offers cosmetic bonding, which can close most gaps between teeth without the need for braces. For this procedure, Dr Sands utilizes state-of-the-art, composite resin material to artfully widen and reshape the teeth to reduce gaps. The bonding material can be precisely matched to the exact shade of your teeth so that the enhancements blend seamlessly with your smile. Patients are generally very pleased with their cosmetic bonding results and often express a renewed sense of self-confidence after the procedure. The cosmetic bonding process is quick and pricing is relatively economical when compared with other options such as porcelain veneers or Invisalign®. However, the results of cosmetic bonding are not typically as resilient or long-lasting as those achieved with porcelain veneers or orthodontics. Bonding commonly has a lifespan of about five to ten years, depending on the materials used, maintenance, and other factors. Replacing existing bonding that no longer has an optimal appearance is also a fairly simple, cost-effective process that can produce transformative results. If you are considering cosmetic bonding to close the gap between your teeth, we encourage you to contact our office and schedule a consultation with Dr. Sands to explore your options. He will perform a full evaluation of your teeth and outline the various treatment plans he can use to improve your smile.